The bay consists of a dense cluster of some 1,600 types of limestone monolithic islands each topped with thick jungle vegetation, rising spectacularly from the ocean. Several of the islands are hollow, with enormous caves. Hang Đầu Gỗ (Wooden stakes cave) is the largest grotto in the Hạ Long area. French tourists visited in the late 19th century, and named the cave Grotte des Merveilles. Note: The people in these fishing villages live on floating houses and are sustained through fishing and marine aquaculture. My name is Abdullah Shahid Rana, I live in Sargodha, Punjab, Pakistan. I am a still a student. I love IT, gadgets, new innovations, softwares, games, movies. As well as Exploring and Developing them. 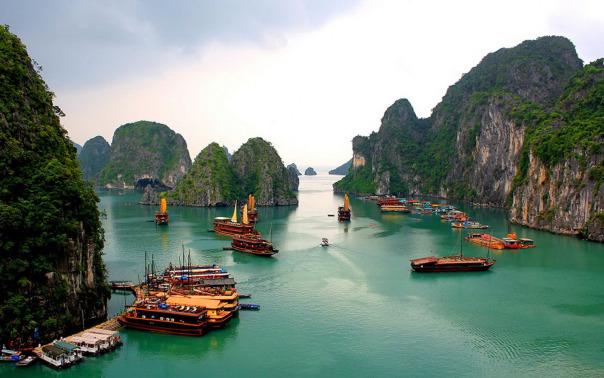 Posted on 20/06/2015, in All, Ha Long Bay, Interesting World, Places and tagged Hạ Long Bay. Bookmark the permalink. 2 Comments.